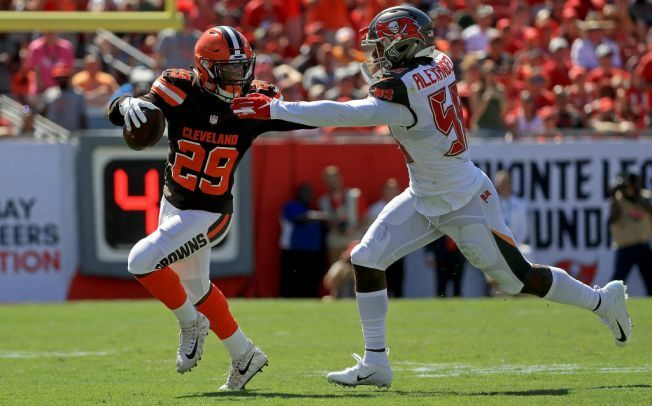 It turns out that new 49ers linebacker Kwon Alexander made quite an impression on his new head coach in 2016, and Kyle Shanahan has never forgotten it. As Keiana Martin of 49ers.com wrote recently, Alexander – then with Tampa Bay – tore apart Shanahan’s offense when he was coordinator of the Atlanta Falcons that season. In a 31-24 victory over the Falcons, the Bucs defense came up big often, with Alexander leading the charge. Alexander had 15 solo tackles, a sack and two quarterback hits as Tampa Bay limited the Falcons to just 42 rushing yards. Shanahan told Martin that Alexander had such a big game that Falcons wide receiver Julio Jones asked him after the game if he could play fullback the next time the teams met, just so he could block Alexander. So, when the chance to go after Alexander in free agency came up recently, Shanahan was all for it. He was a fan. So was general manager John Lynch. Alexander is coming off a shortened season in which he tore knee ligaments. Following surgery and rehab, it remains uncertain when he’ll be able to play, though the 49ers are hopeful he can be ready for the start of the 2019 season. Brian Baldinger, an analyst with the NFL Network, believes Alexander may be a better fit with San Francisco’s defensive scheme than Tampa Bay’s. If healthy, Alexander uses his speed to swarm all over the field, said Baldinger. In fact, he predicts the linebacker duo of Alexander and second-year man Fred Warner could “combine for 200 tackles” in 2019.